Chances are, if you're riding Muni in the morning, you desperately need coffee. 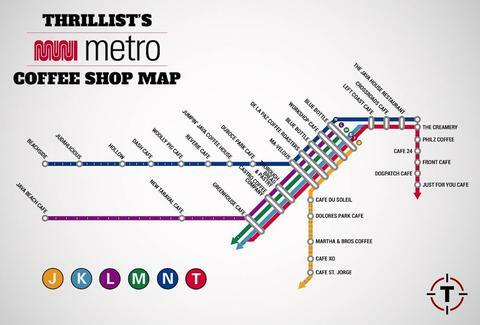 So, we've gone out of our way to make your life easier, by using SF Muni's map and our caffeine rolodex to plot out the best, closest coffee shop to every stop on Muni (that matters), replacing each stop name with the name of said caffeine-slinger. The only rule: all of the coffee shops had to be under a 10min walk away from their respective stop. Joe Starkey is Thrillist's San Francisco Editor, and runs on an inordinate amount of caffeine every day. Follow his jittery thoughts on Twitter.